Going Bananas invites you to send photos and reports to us so we can add you to our list of "satisfied customers". Please email goingbananas@bellsouth.net. "Order arrived in Gainesville this past Thursday well packaged and in good health. Your reputation for excellence is well deserved." "I got the banana plants and was very happy. Probably the healthiest plants shipped I have ever received." We received a Gold Finger from you (in GREAT condition) on Wednesday, April 8, 2015 and planted it soon after opening the box! I have attached two (2) pictures of the plant in its new home just outside of Charlotte, NC. 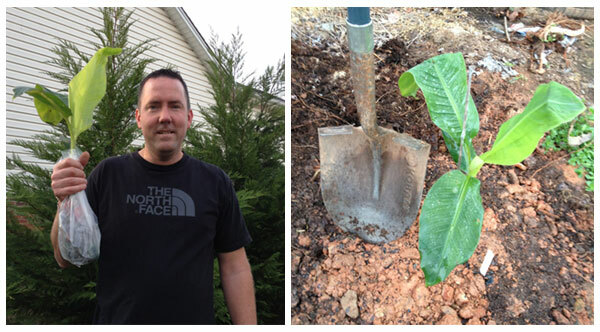 We would like to send progress reports (with pictures) to show you how well your bananas grow outside of the tropics! We look forward to sharing our newest baby’s progress with you.